In these lines, in a most synthetic manner, the American poet Tan Lin analyzes the way in which bodies, products and affects all circulate in a closed loop in which their identities are interchangeable. People who thought they were consumers are also producers, or raw material, in an economy where the essential value is no longer the production of goods, but much more capturing attention, and capitalizing affects and emotions. Otherwise put: how can we give shape to emotions in a world which formulates them in terms of markets? How are we to display the tensions and alarms which result from our incorporation in the abstractions and systems controlled by the economic world? Incorporated! is the suffix, shortened to Inc. which, in the language of economics, describes the transformation of a proper name into a company. In other words, the inclusion of an individual identity within a system to which it is incorporated. Be it a call, a watchword or a password, intentionally ambivalent, Incorporated! is the term which sums up our prolonged inclusion within ideologies and technologies governed by the economy. Incorporated!, which is the fifth Biennale of Les Ateliers de Rennes, pays heed to the affects caused by this incorporation. The exhibition, curated by FranÃ§ois Piron, attempts to capture what nowadays passes through bodies, affects and relations, and what, in particular, breaks down the boundaries between private and public, the unusual and the ordinary. Twenty-nine international artists, some already recognized, others emerging, belonging to different generations, are being invited to construct an exhibition which is keen to put the perceptible experience of artworks in the forefront. Incorporated! is not the demonstration of an aesthetic line, but rather an arrangement of the most contrasted ways of reacting to the world: indignation, silence, irony, anxietyâ€¦ The resources of the imagination and poetry are being called upon, and the show invites visitors to reconsider the forces of emancipation which lurk in the resistance, opaqueness and share of negativity all asserted in the works produced and brought together in the exhibition. Incorporated! is made up of ten solo and group shows. With intensities, colours and overtones that are specific to each venue, these different exhibitions are so arranged as to form a single project. The two-volume catalogue of the Biennale was published by Paraguay following the inauguration of the exhibition and can thus give offer a comprehensive documentation in one book of the installations by the twenty nine participating artists. 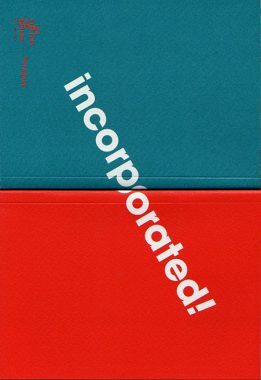 A separate volume includes an interview of FranÃ§ois Piron by Adrien Abline and Elza Clarebout, and new conversations between thinkers of the current forms of incorporation: Vinciane Despret and Yves Citton, and Vincent de Gaulejac and Maurizio Lazzarato.